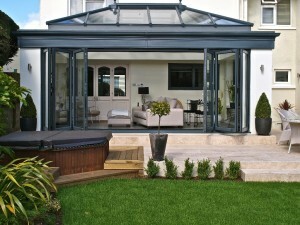 Our Bi-Fold doors transform homes and lifestyles. Bi-Fold doors provide the versatility and flexibility that help to create a relaxing ambience and environment. This product allows you to create stylish, open plan living areas and beautifully panoramic views from any room, to enhance your client’s lifesyle. NEW — Have you seen our new Alumina Bi-Folding doors with foil options to match your PVCu Windows and Doors. Click here to find out more.